Hippocampus Function: What Does It Do? The hippocampus is a central structure within the brain of vertebrates, responsible for handling the storage of memories and the linking of memories to sensations. Another function of the hippocampus is aiding in navigation by enabling spatial memory. There are two hippocampi in the brain, one in each cerebral hemisphere. The hippocampus is vaguely shaped like a horseshoe, and what bridges the two halves of the hippocampus is a long arch made out of nerve fibers and referred to as fornix. The hippocampus is located in the temporal lobes of the brain. Without the hippocampus, people wouldn’t be able to link sounds and smells to memories or retrieve the right memories from long-term storage when they are needed. The hippocampal formation is located within the temporal lobes and it contains the hippocampus and surrounding material. It is made out of interleaved layers of the cornu ammonis (Ammon’s horn) and dentate gyrus. 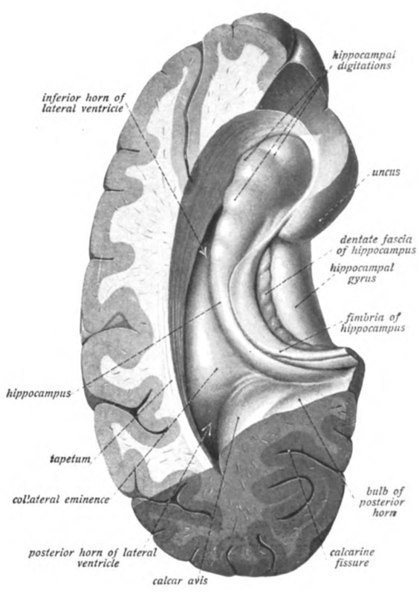 The subiculum and gyri that make up the folds form the hippocampal formation. The dentate gyrus is tucked back into the hippocampal sulcus, and at the dentate gyrus is responsible for neurogenesis. Neurogenesis is the formation of new neurons, and this critical area receives information from other brain regions in order to construct the new neurons. Neurogenesis is needed for learning and memory formation, as well as the formation of spatial memory, which allows us to navigate the world around us. Meanwhile, Ammon’s Horn (AKA the cornu ammonis or hippocampus major) consists of three different subsections: CA1, CA2, and CA3. These areas are responsible for receiving and processing the information that arrives from other parts of the brain. Ammon’s horn is intertwined with the subiculum and the subiculum functions as the primary output system of the hippocampus. 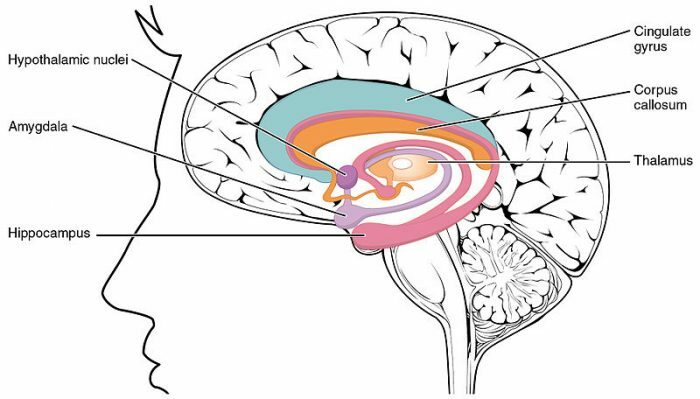 The hippocampal region is enveloped by a greater area called the parahippocampal gyrus, and it is connected to it through the subiculum. The hippocampus plays an important role in a few vital brain functions. The hippocampus is involved in the consolidation of new memories, or the transcription of memories from short-term memory to long-term memory. Without this ability, we would not be able to learn and create new memories. The hippocampus is also heavily involved in spatial perception and memory – the perception of information about one’s surroundings and the translation of this perception into memories about those locations. When memories are formed within the hippocampus, they are often associated with various stimuli such as smell, sights, sounds. The hippocampus also controls emotional responses to similar stimuli. When memories and emotions are strongly linked together with certain stimuli, re-experiencing these stimuli will often conjure a memory linked with them, courtesy of the hippocampus. It accomplishes the intertwining of long-term memories and emotions by working with the amygdala (the hippocampus is also located adjacent to the amygdala). 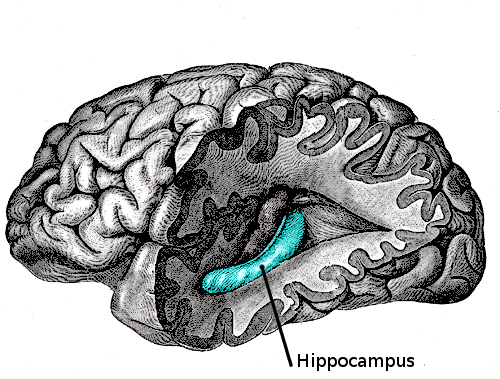 Damage to the hippocampus can result in various memory and cognitive disorders. The primary symptom of damage to the hippocampus is difficulty retrieving memories, being unable to recall memories from storage. Diseases can impact the hippocampus in different ways. For example, Alzheimer’s disease causes tissue loss of the hippocampus, and research into the state of the hippocampus within Alzheimer’s patients has found that Alzheimer’s patients who still have good cognitive abilities have larger hippocampi than those who have developed dementia. However, while the hippocampus is related to disorders of memory recall, it is also linked with other disorders like epilepsy and Posttraumatic Stress Disorder. Individuals with epilepsy who experienced chronic seizures are also frequently victims of retrograde amnesia and other memory issues. As for the relation of the hippocampus to Posttraumatic Stress Disorder, it is thought that sustained emotional stress can lead to the degradation of neurons within the hippocampus, brought about by the continued release of cortisol by the body in reaction to stress. The hippocampus tends to degrade as people age, with some studies reporting shrinkage of the hippocampus observed in the elderly compared with the young. Other studies have challenged these findings, although shrinkage of the hippocampus remains heavily tied to memory issues. It is suggested that physical activity can help prevent the hippocampus from degrading during age, and one study found that the even a mild amount of physical activity almost immediately improves memory function. Recent research into the hippocampus suggests that low-frequency activities within the structure augment sensory responses and enhance conductivity between the different regions of the brain. It is thought that low-frequency activations of the hippocampus help the different parts of the brain integrate with one another and share information, as revealed in experiments done on rodents. FMRI studies done on rodents imply that the thalamus, which has many connections with the hippocampus, initiates neural interactions at various frequencies across the entire brain. Low-frequency activation of the hippocampus is also thought to enhance learning and memory, and the same frequencies are present during slow wave sleep, which is associated with the consolidation of memory and the process of learning. Other recent studies of the hippocampus have found possible “bravery cells” within the structure. OLM cells, present within the hippocampus, appear to influence both anxiety and risk-taking behaviors, and the stimulation of the cells can influence behavior in different ways. The hippocampus’ association with anxiety is also thought to be an influence on decision-making when weighing what actions should be taken to avoid conflict. Approach avoidance-conflict occurs when a situation can result in either a punishing or rewarding stimuli, and analysis of the anterior hippocampus suggests it’s particularly responsive to conflict and that it could be tied to a larger network that processes decisions relating to conflict.